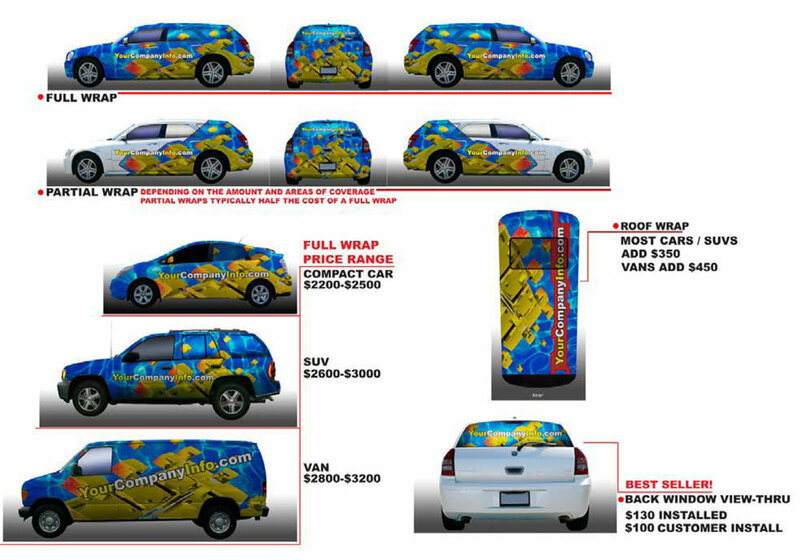 What is a Car / Vehicle Wrap? What’s involved in a car wrap? What’s the difference between a partial and full vehicle wrap? Anything less than a full wrap is normally called a “partial wrap”. A half partial wrap normally includes the entire rear of the vehicle and halfway up the vehicle, and includes a hood logo. A three-quarters partial wrap normally includes the entire rear of the vehicle and most of the way up the vehicle, and includes a hood logo. Typically, a full wrap includes the entire surface of the vehicle. No roof, roof wrapping is additional. In general, we can wrap a van or car in one day. You must always obtain permission to wrap a leased or rented vehicle. However, in general, most leased or rented vehicles have factory paint jobs with excellent paint quality. Vinyl applied over factory paint is best because vinyl can be removed easier without damage or “paint peel.” Leased vehicles are often wrapped throughout the country without incident or damage. We will replace any panels that are defective at no charge for up to 2 years. If you get into an accident etc. we can replace any panels, but you or your insurance company will have to pay for it. We cannot warranty wraps on small curved channels, wraps on plastic, silicon, rubber areas or on chrome as the material is not meant for these surfaces. We stand behind all of our work so if there are any issues we will give you our full attention.